The twelfth group meeting at the Center for Sustainable Journalism went rather differently from past group meetings. For one, the group wasn’t expected to be at the Center until 9AM, as opposed to our custom 8AM arrivals. However, this later arrival time was surely not a reflection of decreased motivation nor any lesser work for completion of the project. Rather, this later hour should be viewed as an extra hour of sleep so that each team member would be even more prepared to carry out the numerous tasks that the project still required for completion. Another major difference in this group meeting was the meeting format; rather than meeting as an entire team in the conference room, each member separated into his or her specific group upon arrival. Thus, each group focused on specialized tasks to progress towards the project’s completion. With the Friday deadline approaching, the members of the journalism team were hard at work, writing their individual segments for the long text story. As outlined before, the individual segments are broken up into five major events and time periods in Christopher’s life: His childhood (from age 1-11), his behavioral problems and numerous foster care placements (from 12-13), the crime (age 14), Christopher’s case and trial, and lastly, Christopher’s current status, habeas corpus and case progression with his current attorney, Steve Reba. Focusing on their particular segments, the journalists’ time consisted of making phone calls to gather further contextual information, reading through the documents to confirm the facts were straight, and pulling out quotes from interviews to add to their segments. Although it is just the rough drafts that are due on Friday, the team hopes to have a more concise outline of the full text story so that Kevin Enners can start merging all of the segments together for the entire long text story. 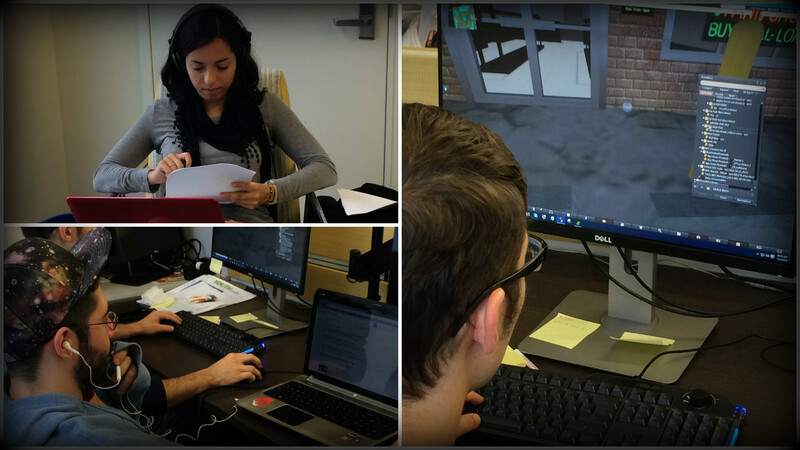 While the journalism team was researching and writing for the long text story, the machinima team was inworld on the computers, working on getting the virtual Pawn Shop (the scene of the crime) ready for filming. In addition, the team completed the creation of the avatars for all of the characters in the machinima story. To add to the virtual world story, the team also collected more items for the machinima onto a platform inworld. Furthermore, Eric Nelson launched the creation of a more straightforward layout for the script to enable more effective recording. Piece-by-piece, the machinima story is coming together as the team prepares for filming. As the journalism and machinima team were establishing the story in text and inworld, the public relations team was focusing on promoting the project through funding in person. The team met with JJIE’s grant writer, Erica Honeycutt, who spoke about how to approach creating a grant for the project. Erica provided the public relations team with tips on grant-seeking basics: to know your mission, to determine what kind of support you are looking for, to discover who is interested in funding virtual reality, and to decide which foundations, corporations, or programs best fit with your mission. For the next week, the PR team will be researching and creating a list of potential contacts that may be interested in funding the project. Although the members of the Virtual World Team were separated into various groups this morning, the project continues to be a team effort. Moving forward, the journalism team, the machinima team, and the public relations team will all be working as one to bring light to this story and the workings of the Juvenile Justice System. The team gathers to read Christopher’s responses, gaining a vivid picture of his life. As we entered the Center for Sustainable Journalism at 8:00 AM for our eleventh group meeting this morning, we were all more eager than usual to get started. Not only were we pleasantly greeted by the delicious sweets that Professor Witt’s wife so kindly baked for us, but we were also greatly anticipating the main event of our morning: responses from our main character, Mr. Christopher Thomas himself. Yesterday, Tuesday, October 27th, Christopher Thomas responded to the letters we sent last week. That’s right; we sent letters to each of the boys involved in the Pawn Shop robbery, and our main character actually answered. With that reply, Christopher expressed his fervent willingness to share his life with us in detail. 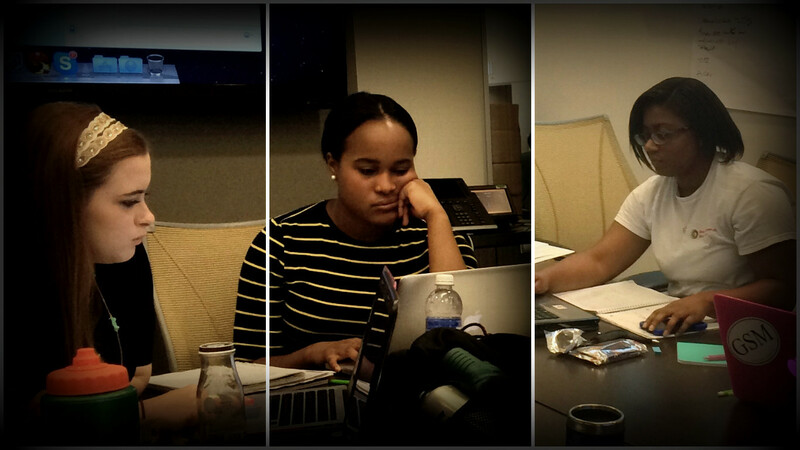 Before reading Christopher’s responses, the journalism team met to discuss the long story segments. Each of the journalism team members described a specific time frame of Christopher’s story based on their assigned segments. Ann talked about Christopher’s early life in numerous foster care homes that led to an unstable lifestyle, then Claire described his life from 12-13 years old, when his behavior became worse and he was eventually sentenced to the Wrightsville Boot Camp for threats to a police officer. Next Kevin outlined Christopher’s story according to the day of the crime, which is told through interviews, various documents, and the police reports (which we finally received on Monday! – who knew a police report from 15 years ago would take so long to dig up). Following Kevin, Camille explained Christopher’s case and trial after he was arrested, then Jackson rounded out the discussion with a clarification of Christopher’s current status in prison and with his case progression with his current lawyer, Steve Reba. Although our deadline was set to be this Saturday, our summaries made us aware of the many holes that still need to be filled in order for us to write an effective, accurate story. For this reason, we have extended our deadline to next Friday, November 6. Until then, the journalists will be scrambling to uncover more information through further interviews and research to write each of their individual segments with greater clarity. After the long text story discussion, the entire group gathered to prepare for the main event: reading Christopher Thomas’ responses to our questions. Until now, all we knew about Christopher and his story is what we had read in the case documents and what other people in his life – foster care parents, lawyers, reporters, investigators and witnesses – have said about him during our interviews. Now was our chance to hear about Christopher’s life from Christopher himself. And that’s exactly what we did. We were soon all reflecting on Christopher’s life as we read through his answers to all of our personal questions. From reading stories about his childhood to descriptions of his life in prison today, we were able to gain a better idea of his personal motives and emotions throughout his life. One of the very last matters discussed was his eventual release from prison. We were reassured when Christopher made it clear that if released, he did have friends he could stay with upon his release. The question is – when will that be? A major remaining question about the case is why Christopher initially received 40 years in prison and why his past legal attempts to reduce his sentence have failed. Recently, the boy who was the other tag-along in the crime received a sentence reduction of 20 years. To determine what is being done now to reduce Christopher’s sentence, we will again contact Steve Reba, his current lawyer, to discuss what legal actions are in play or could be filed that would lead to the court’s review of a habeas corpus petition (legal action or writ by means of which detainees can seek relief from unlawful imprisonment). Our team has researched Christopher’s life from the age of two years old through today. Now that we’ve heard from Christopher himself, he is no longer just the main character of our story. He is the boy who personally experienced the unstable foster care lifestyle described in our files. He is the boy who has interacted with all of the foster care parents, caseworkers, teachers, police officers, and lawyers we have either contacted or tried to reach through information found in the case documents. And now, he is the 30-year-old man who was incarcerated at age 14 for being involved as a tag-along in an armed robbery at a Pawn Shop. From childhood to incarceration, this story is Christopher’s reality. And it is this reality that we will portray in the most realistic way possible through our long-form journalism story and our virtual world machinima. Kennesaw, Ga. (22 October 2015) – An experiment in journalism storytelling debuts today with the public release of the virtual world machinima “The Kid, The Cop, The Punch.” The story is narrated by Xavier McElrath-Bey, a youth justice advocate, telling of a childhood encounter with a violent police officer. 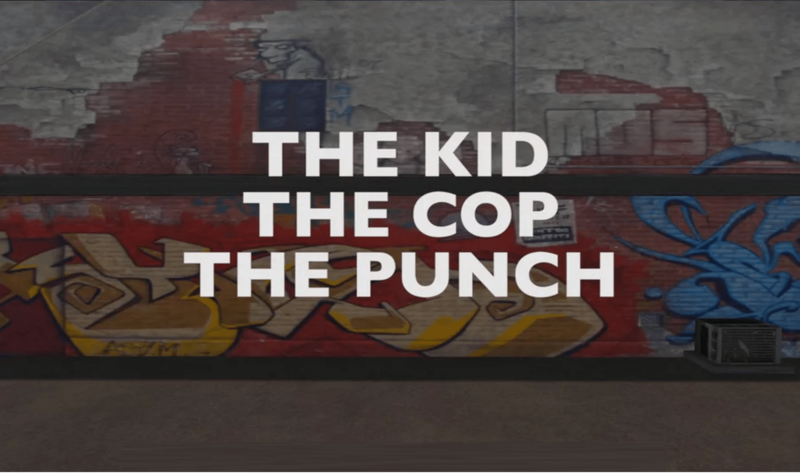 “The Kid, The Cop, The Punch” was produced over the summer by computer science students Derek Maier and David Eric Nelson. 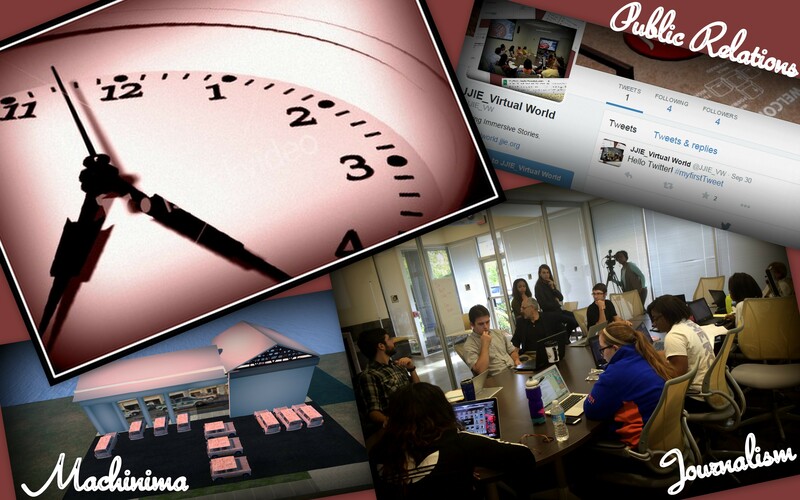 The machinima, a digital inworld film, was edited by Cristina Guerra, a new media arts student. Maier, Nelson and Guerra have been joined this fall semester by eight other KSU student interns comprising a full production company specializing in journalism, machinima making and social media. Along with “The Kid, The Cop, The Punch,” two other mini-documentary, virtual world machinima are currently in production. One is based on an autobiographical poem written by a 17-year-old incarcerated girl; the other, an investigative journalism piece, focuses on a 14-year-old boy, who was sentenced to 40 years in prison when convicted as an unarmed tag-along in a non-lethal shooting. 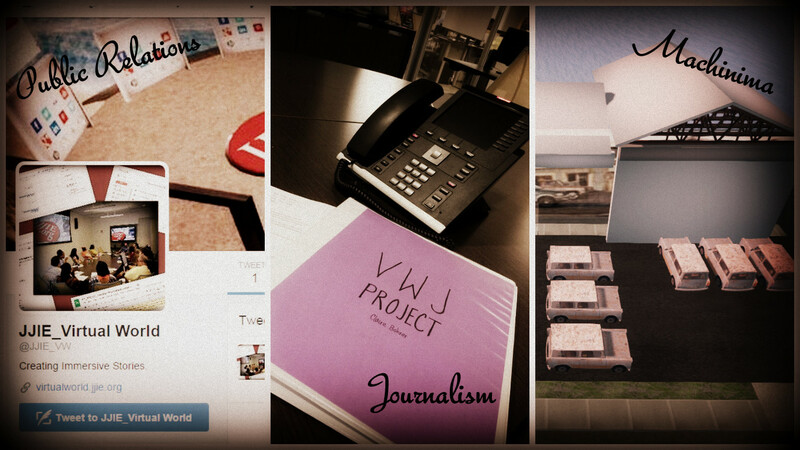 Learn more about the JJIE Virtual World Project as an ONA Challenge Fund winner and its project goals on our Project Overview page. 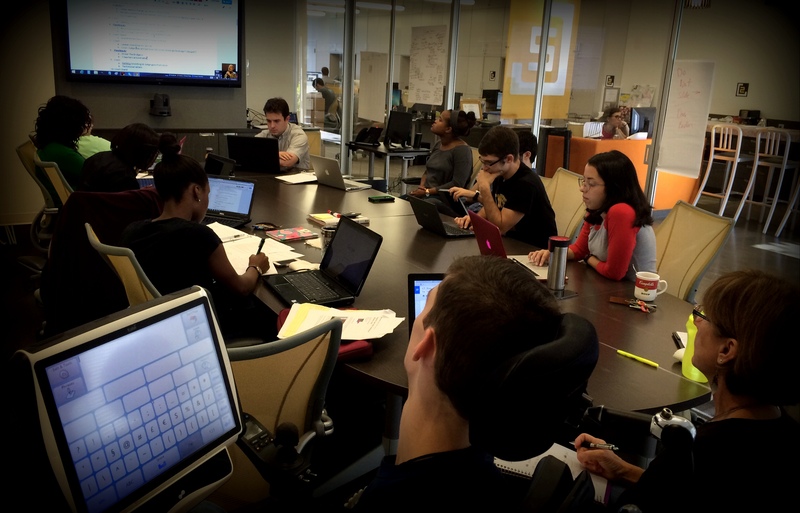 The Center for Sustainable Journalism at Kennesaw State University, just outside of Atlanta, is one of the 2015-2016 winners of the Online News Association Challenge Fund for Innovation in Journalism Education. This journalism project, “Marginalized Youth Voices Amplified in Virtual Worlds,” is underwritten by that winning grant. The Challenge Fund is administered by the Online News Association with support from the Excellence and Ethics in Journalism Foundation, the Robert R. McCormick Foundation, Knight Foundation, the Democracy Fund, and the Rita Allen Foundation. The Center for Sustainable Journalism and its online publication, The Juvenile Justice Information Exchange (JJIE.org), are located at Kennesaw State University near Atlanta, Ga. The JJIE.org is the only national publication covering juvenile justice issues on a consistent, daily basis. By focusing on delivering information and an “exchange” of ideas, the JJIE.org fosters a community of support around the issues facing youth across the USA. The Online News Association is a leader in the rapidly changing world of journalism; a catalyst for innovation in storytelling across all platforms; a resource for journalists seeking guidance and growth; and a champion of best practices through training, awards, community outreach. Kennesaw State University is the third-largest university in Georgia, offering more than 100 undergraduate, graduate and doctoral degrees. A member of the University System of Georgia, Kennesaw State is a comprehensive university with more than 32,000 students from 130 countries. In January 2015, Kennesaw State and Southern Polytechnic State University consolidated to create one of the 50 largest public universities in the country. 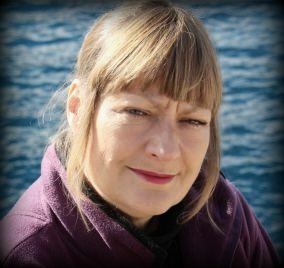 The entire JJIE Virtual Worlds team is very grateful to Chantal for taking the time to share her passion and expertise with them. The team will make good use of Chantal’s advice in their next projects showcasing a young man’s story and a young woman’s poem through the medium of machinima filmed in virtual world. -What must we still get? What pressing questions need answers? Chantal Harvey, expert Dutch machinimist, visited the team via Skype to show some of her recent machinimas and share suggestions to improve the quality of our team’s machinimas. Chantal commented that she was impressed with the Machinima Team’s first work “The Kid, the Cop, the Punch.” She answered several questions we had that we will implement during the production of our next machinimas, “The Christopher Story” and “Forgive: A Poem”. After Chantal Harvey signed off, Derek presented the web and mobile app he had been working on with Soloman Negash, Executive Director of the Mobile Application Development (MAD) Center and our project app expert. Developing an interactive app to for one of our machinima is part of our project’s original grant proposal. As a Computer Science Major, Derek Maier has html coding skills. He put them to good use creating the draft version of an interactive app that allows people to walk through the machinima story, making decisions at critical action points as if they were that person. Their choices will be polled and they will see what other viewers chose. The group discussed the possibility of creating another app from the same template that would be an interactive quiz about Senate Bill 440 (SB440). 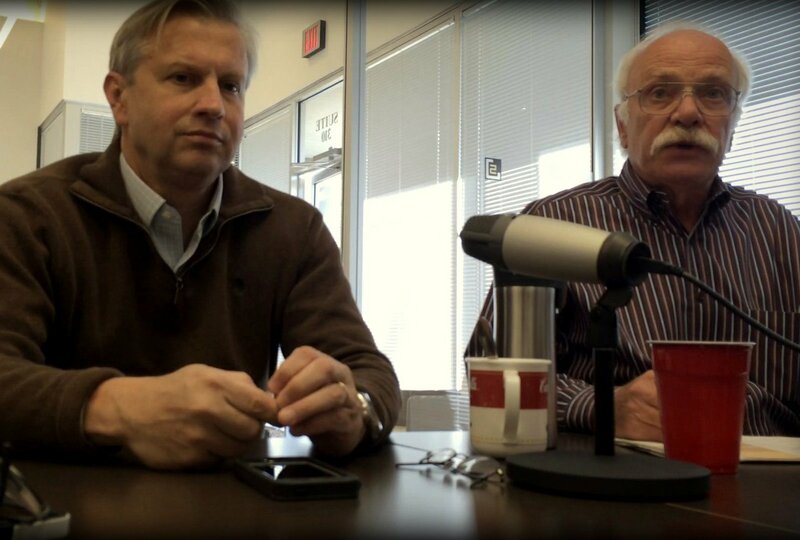 Tom Rawlings (left) & Pete Colbenson (right) discuss the case with the team. Right after the app presentation, we met with Pete Colbenson and Tom Rawlings. Tom is currently practicing law and previously served for over seven years as Judge of the Juvenile Courts of the Middle Judicial Circuit. He was also appointed as Georgia’s Child Advocate for the Protection of Children by Governor Sonny Perdue. Since Tom has had so much experience in law practice, he was able to answer many of our questions about Christopher Thomas’ case and trial. Tom helped us to think of more questions for the lawyers and judges involved in the case so that we can better understand each aspect. 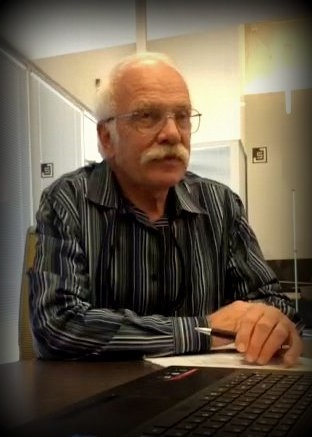 Furthermore, he helped direct us to lead themes for our Long Text Story, from trauma to parole. He explained essentially how the world’s perspective of children has changed since the time of the crime, and how that would affect those past decisions if they were made today. Pete Colbenson, who has been so deeply perturbed by this case, has recently contacted Steve Reba to ask if he can make certain efforts to help Christopher. As our project comes together and more people become involved, we see that we truly do have the ability to make a difference in CHristopher’s life. From what Pete and Tom were suggesting, our project may bring significant attention to the injustice of the highly enforced SB440 laws and parole issues. We could end up helping a lot more juveniles than we originally imagined. After a long, busy group meeting, we concluded once again that we still have many tasks to complete to accomplish all of our goals. Many of these tasks can be attributed to the fact that our goals just continue to grow. Our original goal of giving a voice to juveniles in the Justice System has grown to include highlighting major questionable aspects of Georgia’s Juvenile Law. More and more, we have come to realize that these bigger goals call for a substantially larger workload. Although we are all very busy with our jobs, classes, and other activities, I hope that we can all agree that this is the time to come together with resolute diligence as we advance towards our goals. The call is out for additional dedication to completing our individual tasks. I hope that we are all saying one thing: Bring it on. Neighborhood memories and machinima captures. Check it out now! On October 14, 2015, the goal for all team members at the ninth group meeting was progression – progression towards writing the full-text story, towards establishing PR events, and towards writing the machinima script for the Christopher Story. For this reason journalists, PR people and the machinima team were at the Center for Sustainable Journalism at 8AM, ready to review task lists and make progress. The journalists made calls for more interviews and found additional contextual contacts for the long text story. The PR team designed a publicity campaign to promote the project and events. The virtual world machinimists worked with Gwenette on the script and production pipeline for the Christopher Story. Production scenes, props, and characters are already being developed. Both the machinimists and journalists need confirmation on certain aspects of the case in order to tell the story accurately. It is for this very reason – to uncover the accurate details of the case by hearing every possible perspective and retrieving additional documents – that four members of the journalism team were on a road trip to Augusta, GA, where the crime and the sentencing hearing occurred 15 years ago. Journalists Claire Bohrer, Ann Ondieki, Camille Moore, and Ariel Greenaway, were on their way to Augusta to uncover more information about the case. At 5:30 AM, the journalists had met at the Center, piled into Ariel’s car, and set off on their mission after mapping out their game plan. They first went to the Richmond County Sheriff’s Office to see if the incident police reports requested weeks ago were ready. Since the crime occurred 15 years ago, the paperwork was taking much longer to arrive than anticipated. This delay is definitely a hindrance as deadlines approach for both the machinima and long text story. The journalists will be keeping in touch with the police sergeant to retrieve these reports as soon as possible. Next the journalists navigated to the Richmond County Superior Court to examine case dockets, where they discovered new information and printed some of the documents. Then they went to the Augusta Municipal Court, to take pictures of the sentencing hearing courtroom. Unfortunately, the building’s courtrooms were re-purposed and renovated two years ago. Many of the machinima scenes take place in the courtroom. Pictures are needed to construct a courtroom virtual world scenario. No one in the building had pictures from before the renovations, so the journalists set off on a mission to find pictures elsewhere. After visiting the Augusta Historic Museum and contacting the Augusta Chronicle, they made connections that should be helpful in finding courtroom pictures circa 2000. 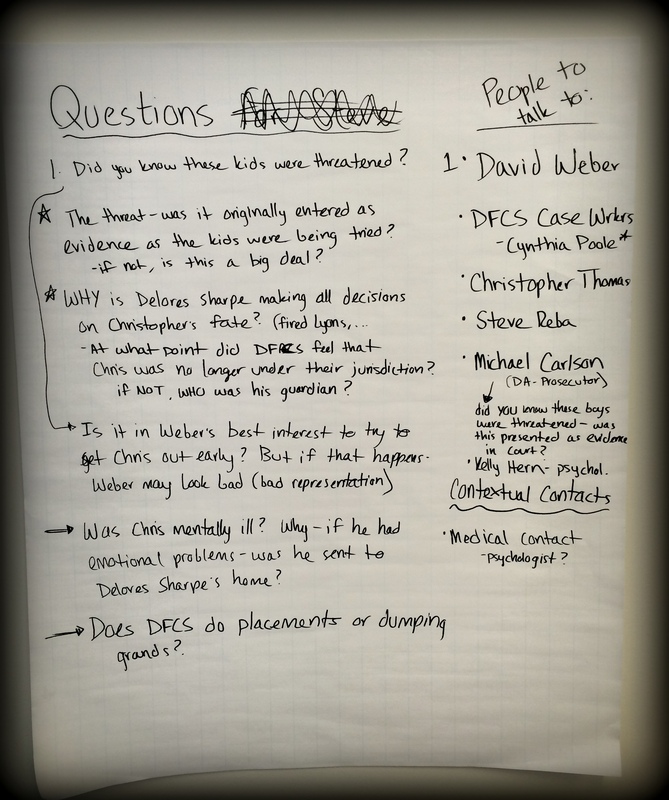 To dig deeper into details of the sentencing hearing, our journalists next visited David Weber, the lawyer who represented both Christopher Thomas and Christopher Butts at the sentencing hearing. Unfortunately, Mr. Weber was in court all morning and could not meet with us. Although he does not seem very receptive to speaking with us, his experiences is a vital part of the story. Over the next week, efforts to contact him will continue. After the downtown Augusta tasks were completed, the journalists traveled to the scene of the crime at A-Awesome Pawn Shop on Tobacco Road. Arriving at the address, they could not find the pawn shop. The decision to visit a pawn shop down the road was unexpectedly a very valuable choice. There they happened upon the owner of A-Awesome Pawn Shop where the crime occurred in 1999. Greg, the owner, did not want to be recorded, but did answer several questions and tell the story of that day from his memory. He also explained there is now a liquor store at the location of the crime scene pawn shop. Today the building exterior looks practically the same with only the exception of different signs. After hearing Greg’s perspective of that day, the journalists took pictures of the crime scene to provide additional data for virtual world scenario construction. The next interview was at the home of Ms. Sharpe, the foster mother caring for Christopher Thomas at the time of the crime. It turns out that Christopher and the two other boys involved in the crime were not the only children in her care. Ms. Sharpe stated she had 13 foster children living in her home in 1999. Ms. Sharpe stories about the crime, the boys and her experiences as a foster parent raised many new questions about Christopher Thomas’ life for the journalists – questions not only for Ms. Sharpe, but for DFCS (Department of Family and Children Sevices) and other facilities where Christopher had been placed. Although the trip to Augusta was to find answers to many questions, the trip actually generated more questions than it answered. Hopefully, these new questions can be answered by the police reports, additional case documents, and a few more telephone interviews. Though there is still clarity needed on some of the story’s details, one thing is clear: As the team delves deeper into this case, the story is coming alive on many different levels. Over the past few weeks, reading the documents has been the equivalent of a book for the team. However, now that our journalists have actually traveled to the scene, spoken with the people involved, and reported back to the team, this case has become very real for all the interns. As settings become real places and characters become real people, the story is no longer just words on paper. It is a reality these people lived through in 1999 and continue to live with today. As one of the journalists in Augusta, I saw the interviews bringing people’s memories into focus. We watched their faces and listened to their real experiences unravel in front of us. We were reminded to treat every detail and person with care and respect. Our new comprehension of the reality of the case strengthens our motivation to tell an accurate story so others can empathize with Christopher Thomas. After all, Christopher is a real person in jail for a crime he took part in at the young age of 13, for which he may have received an unjustly harsh sentence. Keeping this in mind, the whole JJIE VW team is striving to bring light to his case. Hopefully, our project will change the lives of very real people incarcerated unjustly at a young age, educate more people about juvenile justice issues and bring awareness to the problems of the Georgia’s Senate Bill 440. As routine, the Journalists, along with some members of the PR team, were back at the Center for Sustainable Journalism at 8AM this morning for the eighth group meeting. To begin, the team reflected on the progress of each of the individual tasks that Claire Bohrer had assigned them the past week. 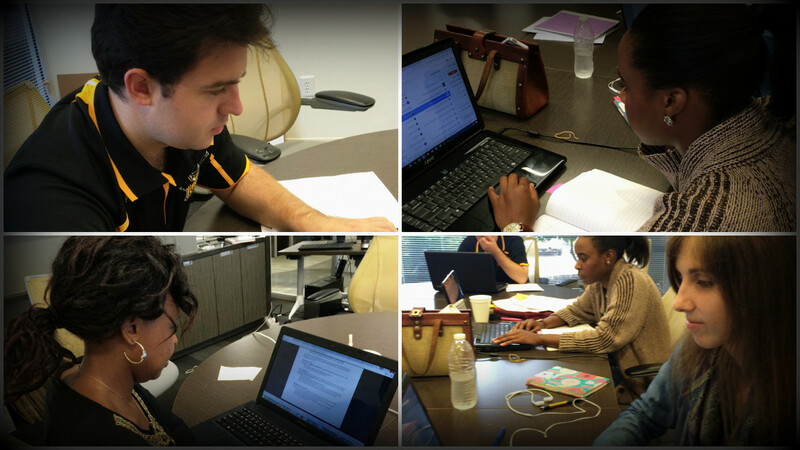 The tasks focused on re-reading the documents, finding more information, and contacting interview prospects. 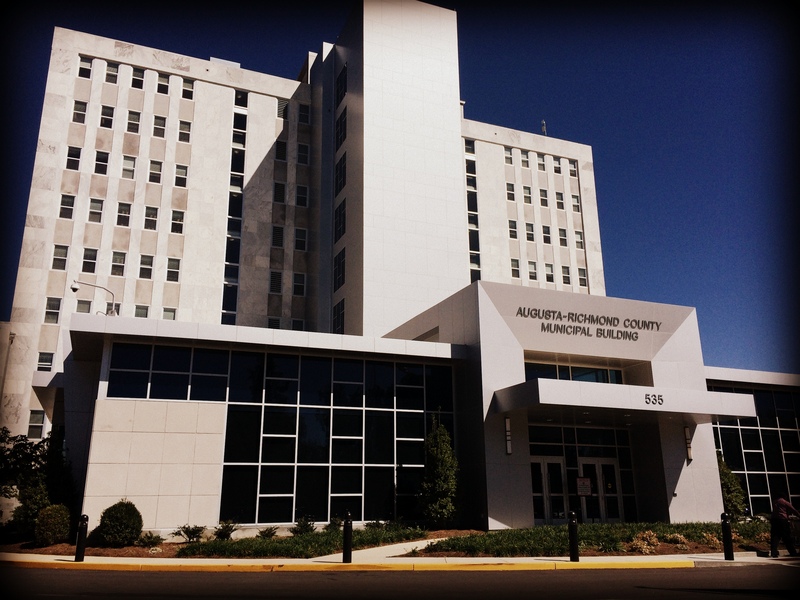 Although we did attain a lot of valuable information, as Camille Moore found great articles from the Augusta Chronicle (Augusta, where the case occurred) and Jackson Walsh found extra SB440 information, we were unable to track down as many interview prospects as desired. It seemed that we were stuck. However, that’s when we had to remind ourselves that we are never stuck – just slightly set back. Unfortunately, with this project, we don’t have a second to waste. 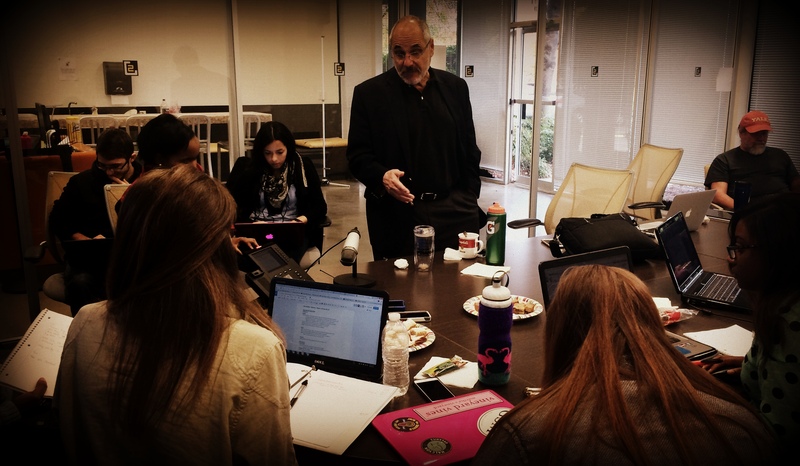 To lighten our hopes and bring everything into perspective, investigative reporter, Jim Walls met with the Journalism team right after the group meeting to give insight on investigative reporting. He introduced us to many helpful sites, which we can use to find contacts, and having reported on criminal cases before, he gave us some great information about the Juvenile Justice System. Furthermore, he agreed to help us research the address of the interview prospects so that we can more easily find all of these locations when the journalists take their next step: a trip to Augusta, GA.
Flashback to the meeting – [sidenote: a flashback is so appropriate, as there will be several as part of the final machinima story]. After discussing the individual tasks of each journalist, we focused on the long story draft that Kevin Enners has begun. We discussed the need to highlight significant parts of his life and to ultimately show the instability of the youth’s life due to his many foster care placements and school changes. We also emphasized the need to tell the story with facts so that we can leave it up to our audience to decide what they think about the case. Furthermore, we discussed the need for additional knowledge from experts in the following fields: foster care, juvenile justice, medicine, etc., all of whom are additional interview prospects being added to the list. From this discussion, we know that the best, most honest way to tell a story is through good reporting, which is why our goal is to obtain as many perspectives on this case as possible. After the long story talk, we transitioned into the presentation of the Machinima Script. The Virtual World Team has worked long and hard to put together a script, complete with characters, dialogue, and specific ideas of camera angles. At this point, with the script written and the scene of the crime (the Pawn Shop) already built, they are ready to continue building all of the pieces that will bring this story to life, virtually. At the very end of the meeting, the PR group discussed their next moves. With an Instagram, Twitter, and Facebook created, it is now our responsibility, as a whole team, to get our project’s name out there. The more attention brought to this project and this entire story, the more successful we will be of achieving our goals to give the youth in the system a voice, to shine light on the injustices he faced throughout his whole life, and to highlight the consequences that can befall any misguided youth who stumbles through any rough upbringing and eventually into the Juvenile Justice System. The most evident problem that is looming over all of our heads is lack of time. The ticking of the clock becomes louder and louder every day. The fact is, we need more time: to contact people – to find people – to interview people – to track down all necessary pictures for the machinima – to build the machinima – to record all voices- to implement our PR campaign. Yes, we need more time. Unfortunately, this is simply something we cannot have. For that reason, we must pull together to not only finish the project, but to complete it to the best of our abilities so that we may give this story and this youth justice. At 8AM this morning, the team was back at the Center for Sustainable Journalism for our seventh group meeting, eager to discuss the next steps. Although Professor Leonard Witt has been at a Journalism conference in Arizona all week, we were able to talk to him via phone and Skype for the meeting. Beginning promptly at 8AM (5AM Professor Witt’s time), the Journalists started off by opening up the CT Timeline in a Google Docs spreadsheet that track any significant information we find in the case source docs. We were searching for any chronological holes in the story. As the story comes together through our timeline that maps out specific dates of significant events, we realize the we are ready to write our first draft of the story. Kevin Enners, who has a great understanding of the case from his research (and writing experience as the author of a crime novel, The Crave), immediately took up the task. To write the first draft, Kevin will be using our CT Timeline spreadsheet of events that outline the youth’s life. Kevin’s first draft will give us a a clear look at what might be missing and what we will want to highlight in the final story. As we discover holes in the timeline, we know we must uncover more information beyond the documents. And how do we acquire this information? Interviews. Unfortunately, the Journalists have experienced some trouble finding the most recent contact information for this dated case. Not only is it difficult to find the correct contact information, but we also have to recognize the number of years that have passed since many of our interview prospects have worked with the youth. So, when we do actually contact these prospects, we have to hope that they can remember the youth to an extent that will contribute to the telling of his story. After a few disappointing roadblocks with failures at finding the correct contact information for interview prospects, the Journalism team discussed ways to overcome these obstacles. One solution we came up with is to hire an investigative reporter. Luckily, from the grant this project received, we have money stored away for any extra means needed to complete the project. An investigative reporter may be just what we need to help us track down some of the prospects whose perspectives are so necessary to the accurate telling of this story. After the timeline talk, Gwenette walked us through the Machinima Script that the Virtual World group has created for the CT Story. The final machinima product will be seven minutes and portray the youth’s life from his early years in foster care, including acting up in school, to the crime, his arrest, and his sentencing. 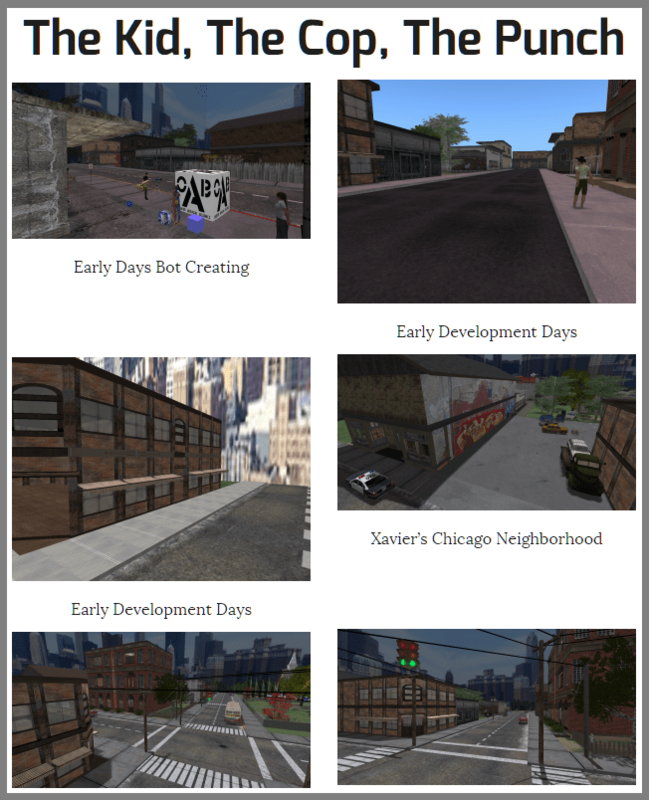 Judging by the previous machinima the Virtual World group has shown us of Chicago crime scene, this machinima will be nothing short of vivid pictures that create a deeper understanding of what this youth has gone through. One major thing to note is the time it will take to create this machinima. This means that the final deadline for the Journalists to get all significant information to the Virtual World group is Wednesday, October 7. With this in mind, all team members are scrambling to find any further significant events to add to the machinima story. After the group meeting, Pete Colbenson, a prior juvenile detention center operator, came in to talk to us about juvenile detention centers and how they have changed over time. Pete gave a plethora of information, sharing his experience-based insights. This helped us all to better understand the rulings and societal events that were occurring at the time of the youth’s arrest that may have greatly affected the youth receiving a 40 year sentence. During our discussion with Pete we gained more knowledge about the history of the Juvenile Justice System and how it works today. This will ultimately help us comprehend and showcase the entire CT story. As we continue to research the contents of the documents and learn more about the Juvenile Justice System, we begin to see our Google Docs are coming together to form a more cohesive picture of the story than just our sketched-out story scenes and scribbled class notes.What started out as thousands upon thousands of pages of cluttered, muddled source docs has taken the shape of a story. A tragic case. A troubled boy’s life. An inside look on the injustices that this youth faced, from the moment he was born to his habeas corpus hearing. Through the numerous individual reports of a boy’s life and his trial transcripts, these documents are a reflection of the Juvenile Justice System and the very real consequences that any troubled youth may be likely to face. By bringing this story to life through the machinima and a written long-story text, we hope to bring awareness to these issues that are so often ignored – until personally faced.